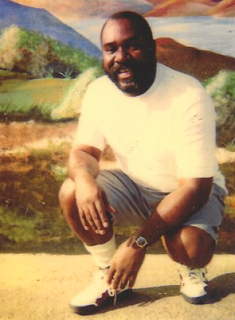 We have just released the latest issue of our newsletter, focusing on 'Soledad Brother' John Clutchette's release from a California prison, Robert King and Albert Woodfox's visit to Santa Cruz CA, Jena 6 Defendant Theo Shaw's graduation from law school, Angola Prison inmates demanding an end to slavery, NRCAT's Torture Awareness Month, and the passing of Tiyo Attallah Salah-El. Working for social justice frequently seems to be a glacially slow endeavor. This last week brought a summer thaw and more than a few things have changed. We celebrate and honor the work of Professor Angela A. Bell and the students in her Law and Minorities classes at Southern University for their remarkable efforts in seeing the long delayed parole of John Cluchette through to his release. Please read the article and comments below on this momentous event. Many Angola 3 supporters will remember the case of the Jena 6, yet another troubling chapter in Louisianaʻs racial history. One of Albertʻs lawyers, Rob McDuff, the amazing Emily Maw of the Innocence Project in New Orleans and Angola 3 supporter Tory Pegram, have continued to work with one of the members of the Jena 6, Theo Shaw, who rose above the massive obstacles and injustices he was faced with to graduate valedictorian of his law class this last week. Congratulations to Theo and best wishes for great success in the future. Less personal but also a great indicator of change a coming is the article on law suits being filed against Angola by prisoners objecting to the prisoner/slave connection.... long overdue! We also want to honor the work of another one of Angola 3ʻs supporters, NRCAT and their excellent work organizing students to protest solitary confinement. Finally, please join us in commemorating the life of Tiyo Attalah El-Salah, a prisoner at Dallas Security Prison in Pennsylvania who passed away this last week. 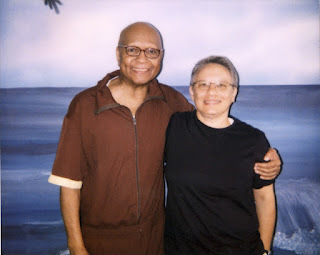 Tiyoʻs life and work came to us through the efforts of Lois Ahrens of Real Cost of Prisons - a special friend to Tiyo and a tireless advocate for so many others. Tiyoʻs passing, much like Hermanʻs back in 2013 reminds us why we can never stop organizing and fighting. To our comrades and allies - we are so grateful for your continued efforts. We hope this newsletter will inspire all of us to keep on keeping on. The good news lifts our spirits and the sad news reminds us that we canʻt give up! 'Soledad Brother' John Clutchette Has Been Released! On Wednesday, June 6, 'Soledad Brother' John Clutchette walked out of the prison gates a free man, following Governor Jerry Brown's final approval of a January 12, 2018 decision by the California Parole Board to grant parole to Clutchette. Watch a video interview with John Clutchette after his release, here. On May 22, Robert King and Albert Woodfox were hosted by the University of California at Santa Cruz, where they spoke on a panel alongside former political prisoner Angela Davis, as well as former prisoner Debbie Kilroy and Professor Craig Haney. As reported on the UC-Santa Cruz website, Davis, a professor in UC-Santa Cruz's History of Consciousness Department for 17 years until her 2008 retirement, argued that "It's helpful to recognize that punishment in the form of imprisonment bears a direct relationship to slavery." The emergence of what's called mass incarceration can be traced back to the 19th century, right after slavery was outlawed, when "free black bodies had to be managed," she said. Woodfox also referred to slavery when he talked about the economic exploitation of prison labor by major corporations. "Every prisoner represents profit," he said. "The irony is that companies will freely use 'slave labor' to produce their products, but if an individual is lucky enough to be released from prison, they won't hire him ... now he's of no value to them." Read the full reportback from the May 22 event here. If a jury had found him guilty of the original attempted murder charge, Shaw could have been imprisoned well into his 60s. But there he was Sunday night, at age 29, standing out in a room of legal scholars. The Class of 2018 at the UW School of Law chose him to speak for them and to them. Even the law professor who called him forward to receive his degree was effusive with praise. He introduced Shaw as "my beyond student" and said, "I learned so much from him. I hope he learned something from me." Shaw's story is a cautionary tale, but not the typical cautionary tale one tells to scare a misbehaving child into straightening up. It's a cautionary tale that law enforcement officers in this incarceration-happy state of ours need to digest. How many other Theo Shaws has our criminal justice system chewed up and destroyed? How much talent is drying up in the sun on Angola plantation? --Read the full Times-Picayune article here. 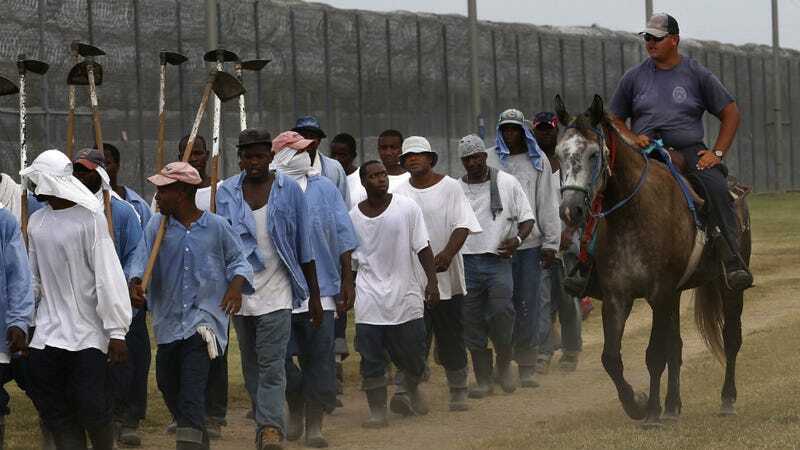 ...Prisoners in Louisiana say the strike wasn't a sudden or isolated event but part of more than three years of organizing with the help of their supporters. During the stoppage, the Incarcerated Workers Organizing Committee issued a list of demands from the prisoners at Angola. "We demand a national conversation," reads one of them, "inquiring how state prison farms across the country came to hold thousands of people from African descent against their will." Prison work in Louisiana dates back to before the end of the Civil War, when the state built its first penitentiary, located in Baton Rouge, in 1837 and handed management over to lessees who then profited off the forced labor. Louisiana took control of the Angola plantation in 1901, housing prisoners in old slave quarters and forcing them to work in the existing cotton fields. As recently as 1979, prisoners at Angola were referred to as "hands," not unlike the way slave masters referred to slaves...Today's organizers want to get rid of forced labor altogether, which is permitted under the Thirteenth Amendment to the Constitution. This June, longtime opponents of solitary confinement in US prisons, the National Religious Campaign Against Torture (NRCAT) is stepping up their organizing work by initiating Torture Awareness Month. They are asking for your participation and support. Already this year, the NRCAT U.S. Prisons Program has hosted virtual reality experiences of solitary confinement at nearly 20 college campuses and religious conferences in 2018. In April, Davis & Elkins College, a small college affiliated with the Presbyterian Church (USA) in Elkins, West Virginia, hosted the NRCAT virtual reality solitary confinement experience. This was part of a day-long campus-wide effort to equip students with knowledge and tools to end torture. The students also gathered over 100 names on the NRCAT petition to end solitary confinement, which was sent to the Governor's office. Learn more about Torture Awareness Month here. I "met" Tiyo in 2005, when I sent him a set of RCPP comic books. He wrote back immediately and over the next 15 years we became as Tiyo would say--"life-long friends," mostly through hundreds and hundreds of letters and an occasional visit or call. Ever since we exchanged that first letter, Tiyo has been a part of my life. This morning at 4:30am Tiyo Attallah Salah-El passed away at SCI Dallas (PA). He was 85 years old and incarcerated for more than 40 years. Tiyo was an amazing person. A sax player since high school, he was a musician and composer. A wonderful writer. His autobiography was published in 2006 and his essays were published in books and read at conferences. A life-long student he earned his BA and Masters Degree while incarcerated. He never stopped learning and appreciating the wider world. He was a prison abolitionist and founded the Coalition for the Abolition of Prisons inside of Dallas in 1995. His accomplishments are too many to name here. His extensive archive is housed at the University of Massachusetts Special Collections. You can read about him here. He was was funny, insightful and kind and a great and loving friend to many, including to me. To honor Tiyo, let us rededicate ourselves to ending the cruel sentence of life without the possibility of parole, or as Tiyo accurately called it "slow death row." Reel Work May Day Labor Film Festival 2018 Presents Together to End Solitary: Cruel and Unusual – the Story of the Angola 3, film and discussion by speakers Craig Haney, PhD, JD, and Marie Levin. CRAIG HANEY Ph.D. in Psychology, Juris Doctorate (JD), academic specialization: psychology and law. Expert witness in Angola 3’s lawsuit in Louisiana; Ashker v. Brown in California; January 17, 2018 Canadian ban on federal indefinite solitary confinement; and numerous lawsuits on behalf of incarcerated people. UCSC Distinguished Professor of Psychology; UC Presidential Chair, 2015-2018; Co-Director, UC Criminal Justice & Health Consortium. MARIE LEVIN African American woman, organizer, and minister; California Families Against Solitary Confinement, Essie Justice Group, NLGSF Prisoner Advocacy Network, Prisoner Hunger Strike Solidarity Coalition; owner of MOMM’s Pastries, employer of formerly incarcerated people; sister of Sitawa Nantambu Jamaa, co-author of the Agreement to End Hostilities, and 1 of 4 Principle Negotiators for CA prisoners challenging conditions in California’s solitary units and general prison population.